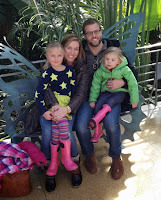 Lately, I can't stop talking/thinking/texting/emailing and now blogging about the forthcoming update to our little lady's room. 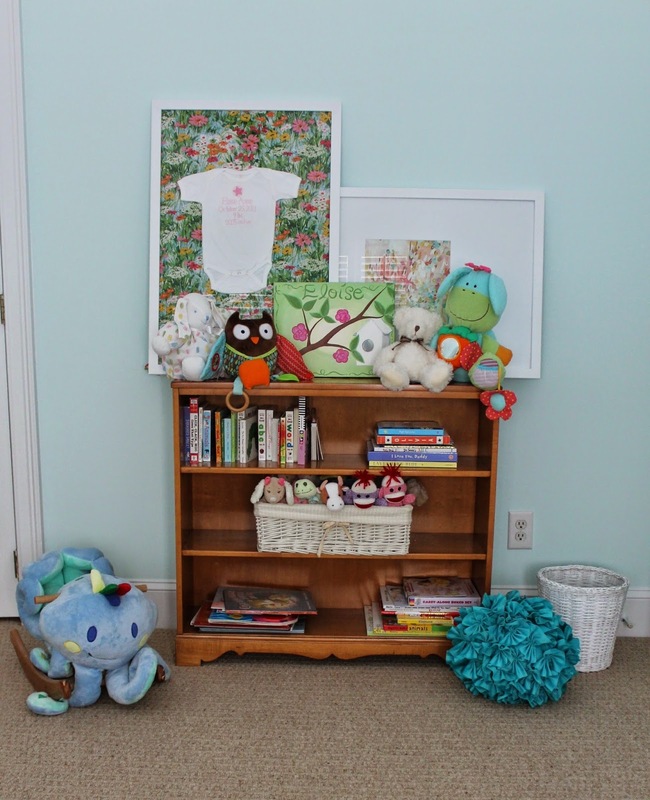 She'll be 3 in a couple of months, is potty trained, and just started preschool - sounds like she's deserving of a big girl bed and a room refresh, don't you think? Here's her room now. Lovely, right? 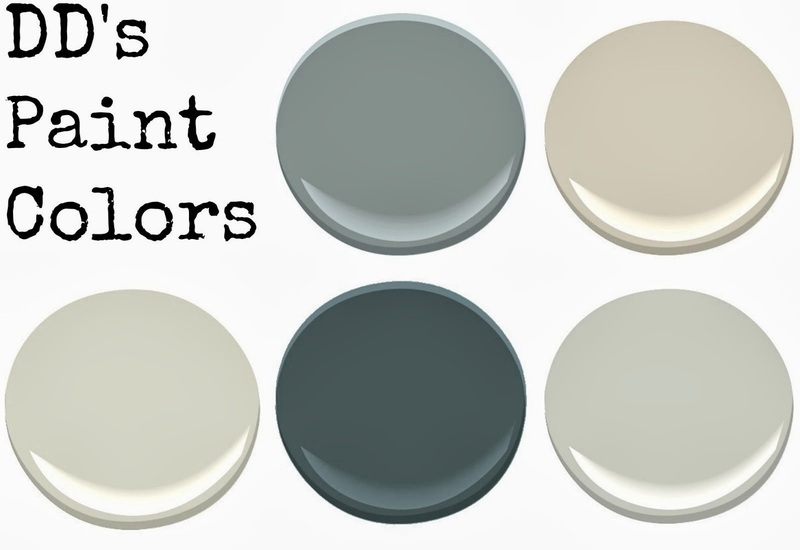 Painted in Crystal Blue by Benjamin Moore, it's a bright, fresh, energizing shade of aqua blue. Right away, I know I want to have a touch of aqua in her bedding. Other existing and potentially staying items are the yellow distressed dresser, maple side table and bookshelf, yellow gingham rocker, and hot pink stool. That's a tall order: aqua, yellow, pink. Not that I'm one to shy away from a challenge. No better place to start than one of the main features of her new bedroom: the bedding. Right away I was drawn to this Crinkle Puff Quilt from Pottery Barn Teen paired with the paisley blue and yellow sheets. Cute. Meets my color scheme. And I am dying over the pompoms on the quilt and the duvet. But, I'm not sure about the green in the quilt considering my foyer/hallway paper is also green. Green overload, maybe? And, no pink. There has to be pink. She's adamant. Especially considering her big sisters room is all pink. 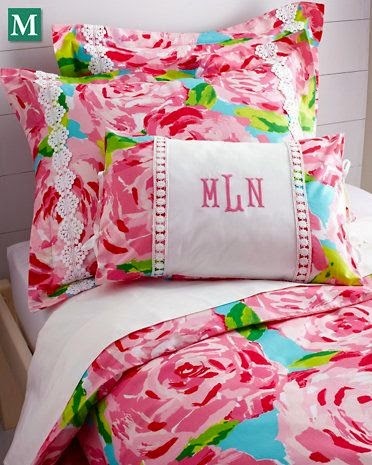 Researching backpacks for my 1st grader and I stumbled across this Lilly Pulitzer bedding from Garnet Hill. Hello, pink. No doubt about that. Plus that hint of aqua I was after. And a bit of green to tie in with the wallpaper in the hallway. But, big huge cabbage roses - not sure about that one. Uh-oh, turquoise, green, pink, yellow and orange. Could it be too good to be true? I've had my eye on the Ellie quilt from the Company Store for ages, but somehow I managed to miss the sale. Last time I checked, sold out. What a disappointment. 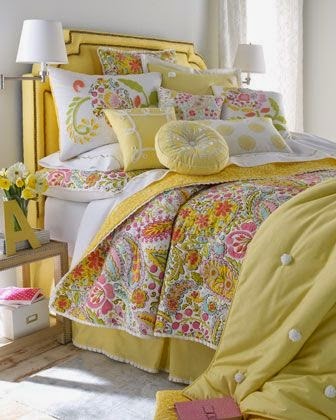 Do you know how incredibly hard it is to find yellow bedding? Really hard. That's why I was so shocked when I discovered this Dena Sunbeam quilt on the Horchow website, thanks to a quick search on Pinterest. I love everything about this image from the colorful quilt (yellow, pink, green and blue!) to the pompom duvet and shams to the embroidered pillows. But, it's pretty grown up - I mean, I'd love it in my bedroom. 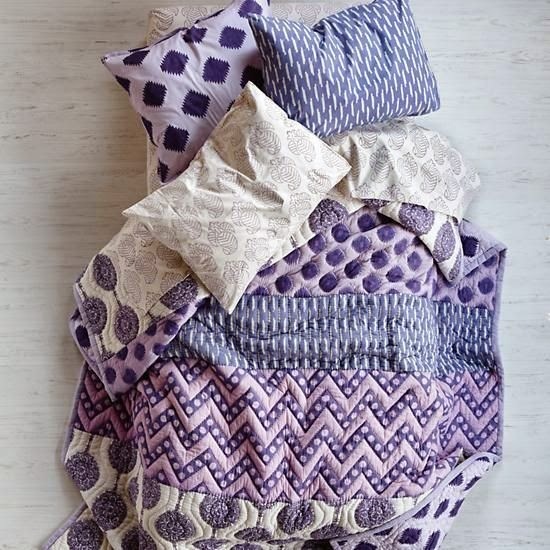 Here's another thought - what if I just threw caution to the wind and went in a totally different direction with this purple bedding from the Land of Nod? Purple and aqua, that works, right? So many options, my mind is spinning.